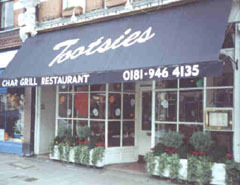 American char-grill style family restaurant offering something for everybody including our award-winning Tootsies Burger. Children are well catered for with a children’s menu, high chairs and balloons. Relaxed and informal atmosphere. Open all day for excellent breakfasts, lunches and dinners, or just a quick bite whilst out shopping. Good Food Guide recommended. Open every day noon-11pm, breakfast Sat-Sun from 10am. All major credit cards accepted (not Diners). 12.5% service charge. Breakfast, lunch and dinner with something for everyone. Try our award-winning Tootsies Burger.